Imperial 2 is a delightful ground floor apartment below Imperial 1. There is an almost tropical feel as you look out across to the sea with a palm tree and pretty flower border of the adjacent Imperial B&B. This 2 bedroom apartment sleeps 4, has a patio, parking for 1 car, a sea view and is paces to the village and beach, fabulous! All on one level, entrance is into the open plan living/ dining/ kitchen with inset down lights, laminate floors throughout and is spacious and modern. The kitchen is fully fitted with integrated full size dishwasher, 50/50 fridge freezer, microwave, double oven, gas hob and washing machine. There are 4 bar stools at the breakfast bar which forms the dining area. 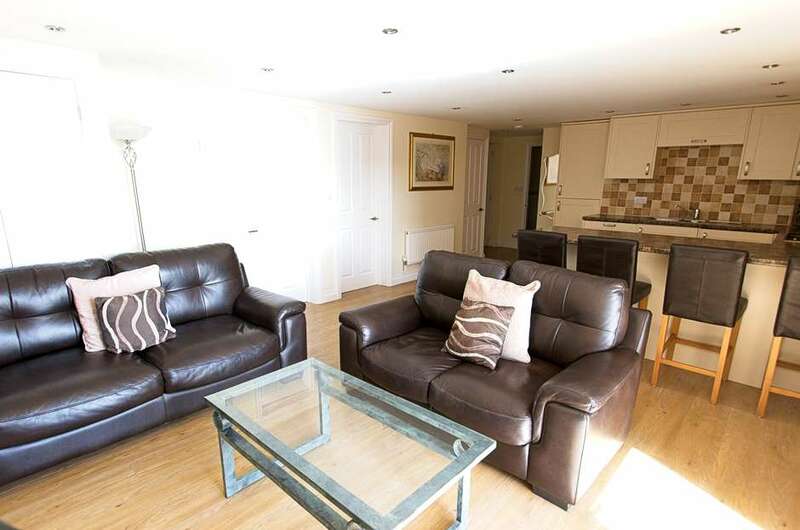 The lounge area has 2 brown faux suede sofas, coffee table and 32” flat screen digital Freeview TV/DVD. The double patio doors open out onto a small patio area (not enclosed) with small bistro table and 2 chairs. There is a family bathroom with sunken bath and shower over, wash basin and WC. In the master bedroom is a double bed with memory foam mattress, bedside units and wardrobe and drawers. Blinds and curtains at the window and laminate floor. This room has its own en-suite with large shower, wash basin and WC. The second room has 3’ twin beds, bedside units, wardrobe, laminate floors, blinds and curtains. This well appointed, newly converted apartment caterers well for families holidaying by the beach as it has a board store and communal outdoor shower for rinsing off after the beach. With its great location and view it is sure to be very popular.